Imagine a program, which will forever change your notion of desktop icons. A program, which in a blink of an eye will assist you in searching lost files or imperceptible folders. A program, so simple and clear to use, and in the same time functional and innovative. 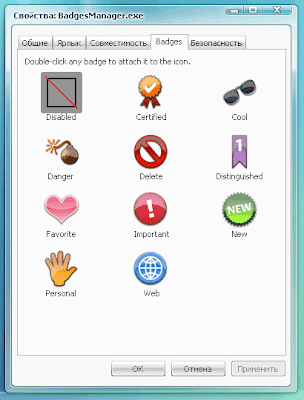 Shedko Software in association with Va-deam's Lab presents "Badges". Badges - the program, allowing placing handy emblems upon familiar Windows icons. From now there is no need to invent sophisticated file names, to drag icons to different corners of the screen or to seek new ico-files for having fast access to a folder with recent projects or with latest images. Place a badge on the desired icon and you will notice it immediately! 10 different kinds of badges, each represents its own semantic category: certified, cool, danger, delete, distinguished, favourite, important, new, personal and web. This will satisfy even exacting users. The quantity of the placed badges is unlimited.